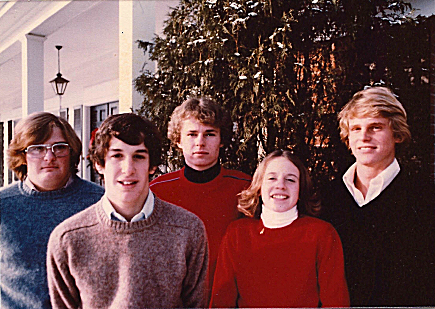 Mom insisted every year that we make one of those holiday photo-cards, and she lined up all five of us one Christmas during our most awkward adolescence. We were on the porch in direct sun on one of the most bitter Chicago Decembers I’d felt (up to that point). We looked squinty, uncomfortable  and, sadly  not fresh-faced. Her moment of genius was to add Molly our stunningly perfect Golden Retriever. Maybe our friends’ and family’s eyes would alight on her! Didn’t happen. She kept looking away trying to escape. Alison Young and her siblings pose for their family’s holiday card photo. Even as we complained about how awful we looked, Mom went ahead and made her photo selection for the card, telling us her choice was the only one of “the roll” that didn’t look as though we were charity cases. Thirty some years later, my brothers and I laugh and cry and hug when we see each other, recalling that day and also that it was to be the last Christmas we’d all be together. We’re all still here, but life has taken us all over the place  and even if we had one “ugly” Christmas, we managed to survive and grow up to be pretty nice people. Last night, Bill Morelock shared an unconventional holiday story from his childhood. You can learn more about that here.